there are three groups of people in the world. those that can count, and those that can't. mmesantos1 wrote: Ok so decided to check out Cinnamon DE for the first time, put Orta on it. Just my last setup but with Cinnamon DE. Interesting DE. What is that window frame theme? I like it alot! taking a wild guess but I believe that's Orta. Yep Lou was right it is orta. Here are the links for the Orta themes. I think you saying it was Orta was my first clue. lKingjr wrote: I think you saying it was Orta was my first clue. Lou you are such a smarty pants. shhh...don't say that. people think I'm nice. Oh ya I meant to say Lou you are such a nice guy! mmesantos1 wrote: Oh ya I meant to say Lou you are such a nice guy! Oh never realized you meant the theme when you wrote "I put Orta on it"
I feel really smart now! Its ok, it happens to the best of us buddy. Great screenie Lou! Really looks good. Very nice work Lou, like this allot. @ikey, clicked your image link but does not show the screenie, would love to see it. The Compiz skydome includes a 1920x1200 size of the Halo 4 HD wallpaper off Google. The Conky setup is a basic looking one--just wanted to be colorful and added a few stuff and learned a LOT about Conky in the process, it was fun! 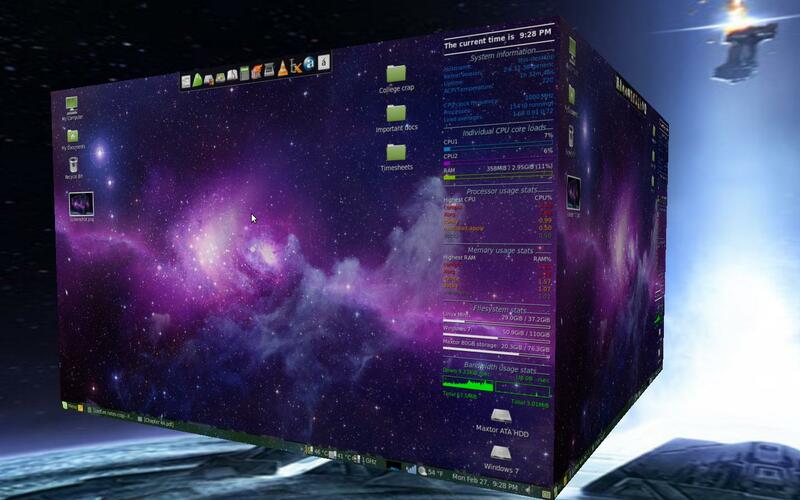 sagirfahmid3 wrote: The Compiz skydome includes a 1920x1200 size of the Halo 4 HD wallpaper off Google. Wow, you got a lot of space there on your desktop! I like your wallpaper, is it available anywhere?